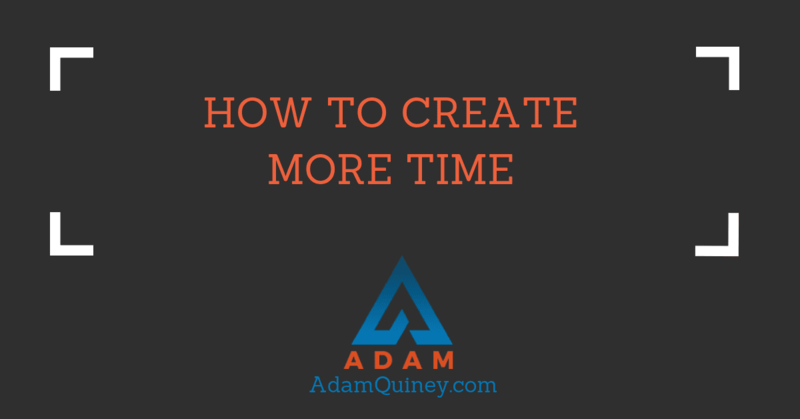 Getting more efficient at handling your time, doing-wise, is pretty simple. There are a lot of different approaches you can take, and you may already be taking on a number of them. If you’re like me, you will predictably be employing most of these, and craving more. For other people, the first step may be to take action towards implementing one of these approaches. This is the machine-gun approach. Give away more of what you’re doing, and you will have more time. Simple. Still, this can be elusive for some people (including myself). There will always be a reason not to hire someone, starting with money. The truth is, you’re never ready to hire that next person. Invest in yourself and your business as though you were already at the next level you want to be playing at. That’s how you grow. GTD will help you manage what needs to be done more efficiently, and do a better job of triaging what demands your immediate attention vs what can be sorted away for another time. Even if you don’t implement the entire GTD approach, you can benefit simply from committing to a weekly-review every week. Set aside a time in your calendar that you are willing to commit to, and then spend that block getting clear on all of the places where you have papers accumulate that you’d like to get a handle on. In future weeks, spend that weekly-review time gathering up those papers and going through them one by one, taking whatever action is required, and throwing them out once completed. You’ll be amazed at the peace of mind that comes from simply devoting an hour every week to getting on top of loose papers, which are a notorious source of open mental loops. The world of the mind is infinite, the realm of a TODO list is finite. When you’re overwhelmed, tasks will keep replacing themselves in your short-term memory, and you’ll drown trying to hold them all in your head (never mind taking action on any of them). Give your brain a break, and write out a list of everything that you have to get done. If you’re in the process of completing a particular task and something new jumps into your head, add it to your list so you can get back to your present focus. If all you do is write out the list and then never touch it again, you will still be diminishing your overwhelm. Don’t try to do this perfectly. Just give your brain (and yourself) a break. Most people try to create routine from an all-or-nothing approach. They’re either going to get up at 5AM, meditate, work out, write for an hour, do handstands, making breakfast for 17 minutes, eat it for 8 minutes, etc — or they have no routine at all. Instead, just commit to and empower some kind of routine. Even if the only thing you’re going to commit to is going to bed at the same time every day, or waking up at the same time, or drinking a glass of water with every meal, create some kind of routine. Make it something outside of what you’re already doing, so that you get an opportunity to expand your muscle in routine, as opposed to patting yourself on the back for what you’re already doing (that’s fine too, but we’re trying to stretch you and grow your capacity). If you took on any one of those things, you would start to create a little more abundance in terms of your experience of time. But maybe you’re already reliably doing a bunch of those sort of things, in which case the facilitative conversation isn’t the one that is really going to shift your life. In that case, we take a look from the ontological side of things — who you’re being that has you experiencing such a scarcity of time in your life. First, notice the ways you create an experience of time being scarce. For example: multi-tasking, procrastination, setting yourself up to be late or just in time to a meeting, hitting the snooze button in the morning, scheduling yourself without any breaks, etc. Second, we take actions as a result of our beliefs, and those actions then reinforce and create our beliefs as real. Notice the actions you take as a result of a belief that time is scarce. Many of these actions will be the same as the first practice in noticing. For example: trying to capture every idea and thought you have (believing there’s a limited supply of them), trying to pack as much as you can into each day, berating yourself for not getting enough done on any given day, having a mental “productivity quota” in your head for whether or not you were productive enough on your weekend, etc. Third, get clear on what you would be doing if you had more time at your disposal. What would you actually use it for? (Eg, “I’d spend time sitting in a park just noticing how beautiful the world is”). Once you are clear on that list, notice all of the reasons and justifications you have for not taking that on right now. Your breakthrough comes in the face of those reasons and justifications, rather than by trying to operate around them. The point of this isn’t to fix any of it (that comes later). The intention of you noticing these things is so that you can see your scarcity of time has very little to do with your circumstances (including your career, family, hobbies etc. ), and that you are the one actively creating this experience. You’ll probably have resistance to that idea, but the good news is that if you can see how you’re responsible for creating your experience, you now have the power to change it. You get to choose where to take action — in the realm of the facilitative, the ontological, or perhaps both. Your resistance is usually the best guide. If you do want more time, and experience resistance to one of these two approaches, that’s probably the place to lean in.